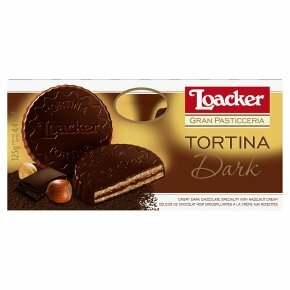 Dark chocolate speciality with a fine hazelnut cream filling (54%) and crispy leaves of wafer. Pure goodness from the heart of the Alps. Loacker, pure goodness!. Individually wrapped. No colourings and preservatives.Crispy dark chocolate specialty with hazelnut cream The height of pleasure, for true connoisseurs! A coating of fine, dark chocolate enveloping two crisp wafers, filled with the smoothest cream from the finest hazelnuts.